This is simply an exquisite guitar. It's built and finished with old-world craftsmanship of the highest order. Starting with Theo's exquisite and rare tonewoods. Whatever magic dust Theo adds to his build process is evident and appreciated. Everything here is so well thought out. No small detail has been overlooked. A custom pickup and hardware sourced from Europe's finest craftsmen were selected for this particular Joe with the mission to realize this guitar's inner voice and mojo. 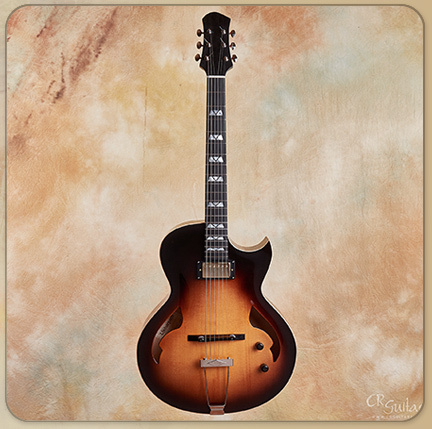 So how do I start this POV... well, let me start with the ending: bottom line, if I had to choose my top 5 desert island electric archtop guitars, I would be hard pressed not to include Scharpach's Vienna Joe in that list. This is why I love guitars. Every once in a while, I'm lucky enough to find magic in an instrument. A guitar where everything comes together and elevates it to another plane. This is simply an exquisite guitar. It's built and finished with old-world craftsmanship of the highest order. Starting with Theo's exquisite and rare tonewoods. To me, the hallmark of a very fine instrument is when in the playing, the guitar seems to "dissolve" as a separate object and becomes just the conduit for creativity. The guitar and the inspired music making process become one thought, one sound, one spark. It is hard to describe but it's something that only the very finest luthiers can achieve. Whatever magic dust Theo adds to his build process is evident and appreciated. Everything here is so well thought out. No small detail has been overlooked. A custom pickup and hardware sourced from Europe's finest craftsmen were selected for this particular Joe with the mission to realize this guitar's inner voice and mojo. It has a wonderful neck profile that reminds me of a perfectly carved '50s Gibson. As far as tone there's more magic. I find that most electric archtops, once plugged in become kind of one dimensional in that you just hear the pickup tone. Not here though. Remarkable as it may seem, it's like the pickup transmits the snap of the wood through the amp. But most importantly, you FEEL the wood in your tone. It is as if the soul of the wood permeates the instrument's sonic palette. The Vienna Joe is certainly a desert Island guitar! Fingerboard radius 12" to 17"
Neck profile C shape, .85"- .97"